I couldn’t get along without “rubber” scrapers in my kitchen…I admit I use them instead of wooden spoons to stir mixtures and then scrape the pan or bowl. The newest silicone ones are so much better than old wooden-handles ones that melted in the saucepan and couldn’t go through the dishwasher! You can buy scrapers or spatulas with plastic, wooden and stainless steel handles…I don’t have any wood-handled ones left…can’t go in the dishwasher. Both the plastic and steel handles have their downsides, the plastic ones will melt a bit, and the metal ones can get hot in a saucepan…you take your choice, I guess. 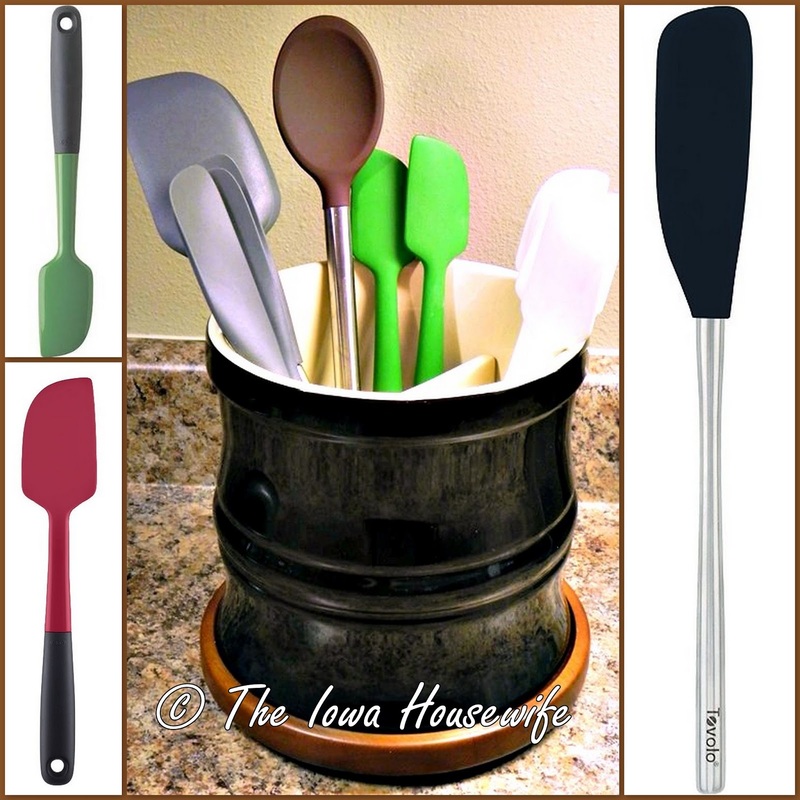 The silicone spoon in the crock is from Tovolo. It's shallow, so it's good for stirring, not so much for serving anything. I particularly like the Tovolo Jar Scrapers, they will scrape out a mayonnaise or peanut butter jar perfectly, as well as bowls, pans and measuring cups. I also have some of their large scrapers…those are a little soft on the edges for heavy cookie or bread dough. For that, I prefer the OXO silicone spatulas. I have both jar scraper sizes and large ones. There are still old-style OXO spatulas around, where the handle joined the head right at the top of the handle…the newer ones like these with the joint half-way down the handle are a big improvement…junk doesn’t get inside the head. I keep mine between my stove and my “mixing area”, in this nice tool crock with an inside removable divider and a turntable. I purchased the crock and turntable when the Chefs Catalog was going out of business…I don’t know if anyone else is making them now or not, but I can’t cook without a tool crock of some kind. Myrna actually has two crocks as her stove and mixing area are separated. Myrna and I both love our OXO silicone cookie spatulas, and my husband does too…he uses one for turning eggs; it is easy to get in the pan, so I have to have two - he won't let me use his egg turner! They make a larger version…too big for our daily use but I use mine for fish fillets and on the grill. Talking about spatulas or turners, I have a big collection of metal ones…large and small, for a cookie and brownie spatula, and for frosting and smoothing out batters, spreaders for sandwich fillings, etc. Can’t do without them, they have their own place in a drawer in my mixing and baking area. As you can see, I have had them many years, a couple since I married, and expect to never have to replace them. Look for sturdy ones; restaurant supply houses are a good source. It's really the best spatula I've ever used for eggs, cookies--you name it. I love that it is nonstick and won't mark my Le Crueset Dutch ovens when I use it for deglazing the bottoms. I have 4 because everyone here grabs for it first--and I was tired of not having one for my own use! Would never want to be without it. That's quite a recommendation...my husband's favorite crepe pan that he uses for eggs is also from Berndes, very good quality. Thanks.